One of the top draws of Santa Teresa is the surf. On miles of pristine beaches you find several surf spots for beginners and pro surfer. Our hotel gladly arranges surf lessons or surf photography for you. To unwind and relax during your vacation you can practice yoga. Several places in Santa Teresa offer yoga classes of different styles and levels. This is also perfect for stretching your muscles to get prepared for surfing. Amble on horseback through the mountains and beaches of Mal Pais and Santa Teresa. Different tours are offered, based on the rider's level of experience. The 2-hours tours are offered for sunset or in the morning. 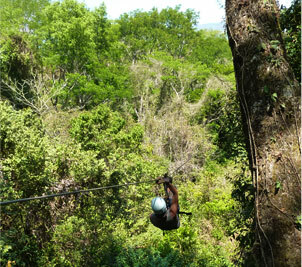 Swoop through the jungle canopy in Mal Pais, by the side of the Cabo Blanco National Park. It's a thrilling adventure of nearly one kilometer length with 9 cables and 11 platforms set high in the gigantic trees. Stand-up Paddle Boarding (SUP) is a great body workout on the waves and it is really easy to learn. In the water you often see turtles, manta rays and other maritime life. Rent a quad for one or more days and have a thrilling adventure as you can independently explore all surrounding beaches and attractions of the Santa Teresa area. 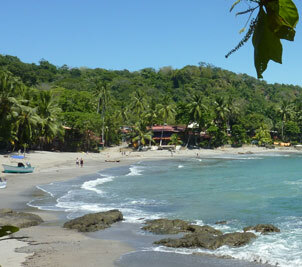 The beach village of Montezuma is famous for its scenic beaches, rivers and waterfalls. You can swim in large pools fed by a jungle river, go shopping and have lunch in the funky village center. A full-day, all-inclusive tour to one of the best diving and snorkeling spots on the Pacific coast of Costa Rica. After a 50-minute board ride you arrive on the tropical paradise of Tortuga Island where you can snorkel in crystal clear waters. any of these tours for you!